To get a decent quality and comfortable leather office chair you could expect to pay several hundreds of dollars if not thousands. Fortunately for what we think is the Best Office Star Leather Chair, we were surprised at the affordability of this chair. This chair is one of our favorite completely adjustable and customizable office chairs on the market. The work smart high back office star chair is made from Eco Leather. Eco leather is the result of a tanning method that’s more environmentally friendly. Eco Leather still boasts all the perks of genuine leather but is just better for the environment and consumer. The twin stitched leather holds up rather well under heavy duty usage for extended periods. While I believe the padding and design of the chair looks rather ergonomic, I’m not going to say it’s the best for lower back pain etc. As this is usually an individuals specific problem, it would be unjust to state it here. However I have heard a few times, that being in possession of this Office Star chair (much like the Alera Brand), back pain has been reduced. But like I said, it’s a tough one to judge on a person to person basis. This Eco leather office star chair is BIG. It’s very spacious and made from real solid materials. If you look after this chair it may reward you with years of comfortable sitting. The base of the chair is heavy duty Nylon and the casters are dual carpet caster wheels. The size and solid build of this office chair make it a good choice the plus size people. Take note, there is no specific weight capacity limit recognized in the manual, so if you are significantly overweight or obese, then I wouldn’t recommend this chair. To much risk is involved, especially as one can find numerous office chairs for heavy people throughout this site. The function-ability of this chair I find is amazing. One can almost fully customize the seating preferences to the body. The chair is equipped with 3 levers down by your side. These levers adjust the seat height and the angles of the back and the actually seat. Which can be set to rock or recline. Locking the chair in a forward position is a pretty unique feature on an affordable chair like this Office Star. It may seem a little weird at first locking the chair tilting forward. But it’s excellent for working over your desk while providing support for your spine. The chair also fully swivels. 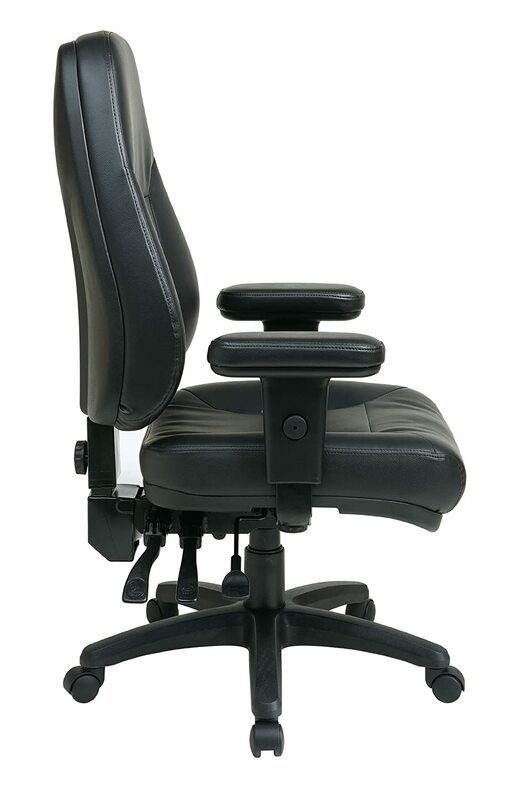 The padded arms can be removed if you prefer an armless chair and the height of the armrest can be adjusted. The angle of the lumbar support can also be adjusted. as you can tell, this Eco Leather office chair is very adjustable and I find it to be ergonomic. As previously stated, this chair seems bigger then the normal office chair. The overall dimension measure in at 27.25″ Wide x 26″ Diameter x 48.5″ Height. The chair can raise from 18 inches to 21.5 inches and arms to floor measure at 24.5 inches. For more specification details visit Office Star Specs.